Pilots from the 3rd FG in front of a Chinese P-40. The image is probably taken in the spring of 1942 at Wujiaba Airport outside Kunming. 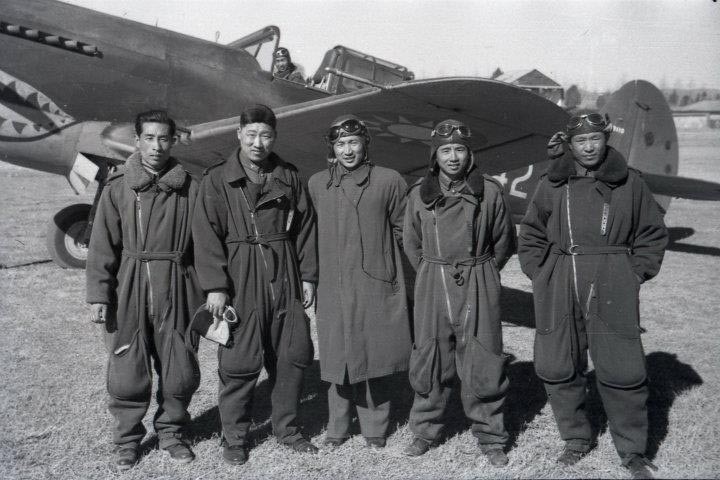 Identified pilots are (from left): Yuan Chin-Han, Wang Han-Hsun, unknown, Tsai Ming-Yong and Wang Wen-Hua. Image copyright R. T. Smith used by permission of Brad Smith. Captain Wang Han-Hsun served as commander of the 26th PS of the 5th PG between May 1937 and 1 October 1938. On 9 December 1937 fifteen Japanese bombers escorted by eight fighters attacked Nanchang, the capital of the Kiangsi Province. Captain Wang Han-Hsun, commander of the 26th PS of the 5th PG, engaged them leading four Curtiss Hawk IIIs from Wuhan. During the engagement he shot down a Type 96 fighter. Three of his aircraft was however lost, among them Hawk no. 2604, flown by Chou Ke-Yi, who was killed. Kuan Chung-Chieh of 8th PS (Hawk no. 2606) managed to parachute from his burning aircraft but was strafed and killed by Japanese aircraft on the ground. 29th PS’s new commander, Lin Tian-Jiao, also took part in this combat and was shot down. The Japanese reported that eight A5Ms had battled with 20 Chinese and Soviet fighters. The Japanese claimed that they shot down twelve enemy aircraft while losing one A5M (the one shot down by Han-Hsun). Twelve more Chinese aircraft were claimed destroyed on the ground. It seems that the lost Japanese pilot was PO3c Naoshi Teramatsu of the 13th Kokutai (even if there is some uncertainties regarding the place of his death). PO3c Kan-ichi Kashimura of the 13th Kokutai was involved in a combat with a large number of Curtiss Hawks and after shooting down one of them, he collided in the air with another Chinese Hawk III, which already had been shot down and was falling out of control. A third of the left wing of the A5M1 (no. 4-115) was thorn away, but Kashimura was able to return to base. After four landing attempts, the aircraft somersaulted on touching the ground on its fourth approach and lost its tail in the subsequent crash. Kashimura walked away from the wreckage without any injuries. Kashimura’s exploits in this combat was widely published in Japan. Kashimura was killed in combat over Russell Island on 6 March 1943 and at the time of his death he was credited with 12 victories (10 of them over China). In this combat Sea1c Kuniyoshi Tanaka of the 13th Kokutai (in his first combat) used up all his ammunition in claiming to have shot down a Curtiss, a Hawk and a Corsair (his first three victories of a total of 17 – twelve of them claimed during the China Incident). Kiyoto Koga of the 13th Kokutai claimed three I-16s in this combat (victory nos. 11-13). In November 1939 Han-Hsun served as deputy commander of the 5th PG. On 4 November 1939 72 G3Ms (36 from the 13th Ku, 18 each from the Kisarazu and Kanoya Ku) attacked Chengtu in Sichuan Province in retaliation for a highly successful attack on the Hankow Huang-chia-tun Airfield on 14 October 1939. (DB-3 bombers flown by Soviet volunteers, who destroyed over 50 Japanese Army and Navy aircraft made this attack.) The G3Ms came over in two formations, each with 36 aircraft. Captain Okuda (nicknamed ‘King of the Bombers’), commander of the 13th Ku, led the first formation with all of the aircraft from 13th Ku. The Chinese responded by sending two formations against the attackers. The first Japanese formation was heavily attacked by seven Dewoitine D510s of the 17th PS, led by Captain Shen Tse-Liu and seven I-15bis from the 27th PS led by Captain Hsie Chuan-Ho. The 27th PS first made contact with the 13th Ku about 4,000m over Fenghuang Shan. The Chinese Air Raid Warning Net had given ample warning and the Chinese fighters, equipped with oxygen and radio receivers in the lead aircraft, were able to climb and attack the Japanese from above. Diving down at 65 degrees from behind, the I-15bis concentrated on the leading flight of G3M's. After the initial pass, the I-15bis followed up with firing passes from the rear at the same level or slightly below. Then came the cannon armed D510. Captain Shen led his squadron in a level attack from the front. (Past experience had shown that when firing in a dive, the spring tension of the drum magazine in the Hispano HS-404 cannon was insufficient to feed the gun causing stoppages.) This time, under ideal conditions, Shen was able to make one devastating head-on pass on Okuda's G3M. Multiple hits by the deadly 20mm cannon set Okuda's G3M on fire at the right wing root. The fire then spread to the fuselage fuel tanks. The G3M then nosed over in a dive, which resulted in both wings snapping away. Shen and his squadron turned around to attack the Japanese formation form the rear. This was when the concentrated firepower of the G3Ms began to tell. Shen’s D510 No. 5921 was damaged and he made a forced landing in which he was injured. Another D510 (No. 5924 flown by Lieutenant Chen Kwei-min) was damaged in the fuel tank but managed to land safely. Three 27th PS I-15bis were slightly damaged. Another G3M was shot out of formation smoking heavily but was not seen to crash by the time the Chinese fighters retired. The second Chinese formation was led by deputy group commander Wang Han-Hsun and included nine I-15bis led by Captain Ma Kwok-Lim of the 29th PS and six I-16’s of the 26th PS. Included in Ma’s group were Lieutenant Teng Chung-Kai, now promoted to deputy squadron leader. They met the Kisarazu and Kanoya formation over Taiping-shi Airfield. Ma led the I-15bis in a vertical diving pass on the leading flight of the formation. After the initial pass, the I-15bis turned back to attack from below and behind. They were joined by two I-16's from the 26th PS, which had become separated from their formation. After the first two passes, the volume of return fire from the Japanese formation was seen to appreciably slacken. The lead ship from the Shotai to the right of the leading shotai was seen to catch fire and gradually descend below the formation. Teng in I-15bis No. 2903 was credited with hitting this aircraft and contributing to it falling out of formation. In a final firing pass from behind and below, the concentrated return fire from the Japanese formation hit Teng’s aircraft and he crashed to his death. Wang Han-Hsun in I-15bis “V-2” was wounded and made a forced landing. All but one of the other I-15bis were damaged and three more had to make forced landings (I-15bis nos. 2910, 2904, 2907). Both of the 26th PS I-16s were also shot up badly, one, No. 2609 crashed at Jintang, killing its pilot Lieutenant Tuan Wan-Yu and the other, No. 2604 force landed at Pengshang. During the attack the Japanese dropped over 100 bombs on Fenghuang Shan Airfield. The second Japanese formation of 36 aircraft dropped over 200 bombs on Wenjiang Air Field. They destroyed one aircraft and two trainers on the ground. After the battle, the Chinese found three wrecks and the bodies of Okuda and one of his Buntaicho. The Japanese, however, admitted to a total of 4 losses. Wang Han-Hsun ended the war with 1 biplane victory and a total of 2. (a) A5M from 13th Kokutai shot down. It seems that the lost Japanese pilot was PO3c Naoshi Teramatsu of the 13th Kokutai (even if there are some uncertainties regarding the place of his death). Soviet Fighters in the sky of China, Part II - Anatolii Demin, 2000 Aviatsiia Kosmonavtika 10 (translated by George M. Mellinger). Information kindly provided by Raymond Cheung, Tom Chan, Samuel Hui and Erich Wang.